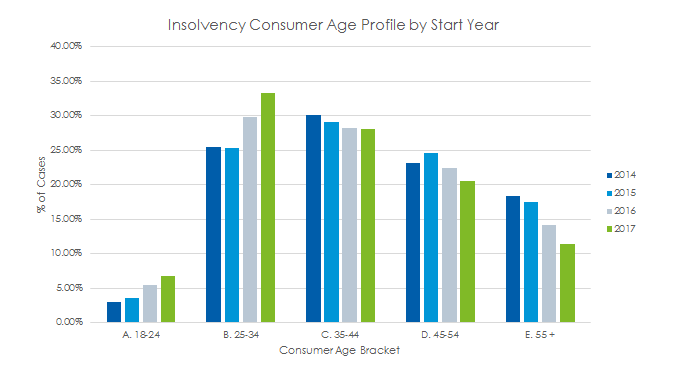 “Our latest research shows a significant and growing disparity between the level of individual insolvencies across age profiles and UK regions. Those aged under 35 are increasingly likely to enter into insolvency and those living in Peterborough are up to fourteen times more likely to become insolvent than people residing in London. “One in 239 people in Peterborough and one in 273 people in Norwich entered an Individual Voluntary Agreement (IVA) in 2017. Other insolvency hot spots included Brighton (one in 323), Portsmouth (one in 333) and Newcastle (one in 358). People living in the major metropolitan areas of Liverpool (one in 814) , Glasgow (one in 842), Birmingham (one in 1020) and London (one in 3478) are much less likely to enter into personal insolvency. “The data also highlights a fundamental shift in the age profile of people entering personal insolvency. Under 35’s now make up 40% of all new IVAs compared to just 27% in 2014. This is being driven by cost of living pressures, with under 35’s more likely to live in private or social rental properties and have an element of income coming from welfare benefits. Other contributing factors may be the number of individuals finding themselves limited to higher cost credit products, limited wage growth and higher risk of unemployment. “In contrast, over the same period (2014-2017), there was a 33% drop in people over 55 managing their debts through an IVA, largely due to factors such as the lower cost of servicing mortgages. This has provided people at risk of problem debt with a protection cushion in their budgeting, although the Bank of England June Financial Stability Report1 stated that the percentage of people with debt-servicing ratios (DSRs) of over 40% has increased recently from 0.9% to 1.3%. A DSR of over 40% suggests a higher risk of financial difficulty.